ANNAPOLIS, Md. 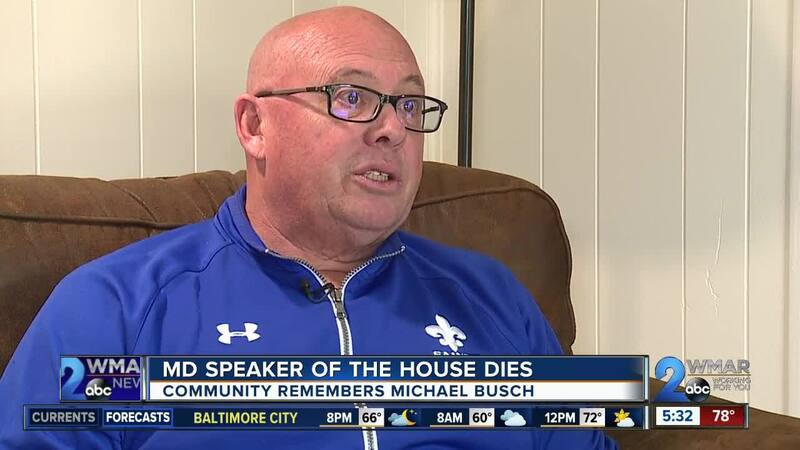 — Michael Busch is Maryland's longest serving Speaker of the House of Delegates. And on Sunday, he died at the age of 72 after being hospitalized for pneumonia. Governor Larry Hogan immediately ordered all Maryland flags fly at half-staff to honor Busch's distinguished life and legacy. They will stay that way, throughout the state, until Busch is laid to rest. Before Busch got into politics, he was a coach and teacher at St. Mary's High School in Annapolis. "I could tell he really enjoyed when we talked about football and when we talked about St. Mary’s," said Brad Best, an employee at St. Mary's High School since 1989. He was the first teacher/coach combination since Busch. He said, "that just instantly gave me a little connection with Mike." A connection that continued to grow. "Mike Busch was the first person to come by the school and talk to me and give me the history of St. Mary’s," said Best. Quickly Busch became Best's mentor. "For the first couple years he probably called once a month just to check in and see how I was doing and if I needed anything." They've stayed in touch over the years. Best was upset when he heard about Busch's passing but knew his health had been deteriorating. In 2017, Busch had a liver transplant, and, in 2018, he had a heart bypass surgery. Best saw Busch for the last time in 2018, when his wrestling team was honored at the State House. "Physically he obviously looked different. He looked thin and tired, but he still had a great sense of humor," said Best. A great sense of humor, upbeat and always in a good mood. Best continued, "to me that’s how I remember him. I couldn’t see him saying a mean thing to anybody. I think trying help everybody is really what he wanted to do; he definitely helped me."